Manchester City Football Ground, Maine Road. HEAVY metal fans besieged a football stadium today after US rock band Guns N’ Roses pulled out of their Manchester show just hours before they were due on stage. The 30,000 fans — which included big contingents from Merseyside — were set to watch the Maine Road show today, the first date in the UK leg of the band’s massive world tour. Doctors have told lead singer Axl Rose, who is suffering from physical exhaustion, to rest for 36 hours. Rose, who is staying in Paris where the band played their last concert, decided the concert was off at 8.20am today. Now promoters are frantically trying to rearrange the event — otherwise they will have to refund all the £25 tickets sold. A new date for the band at Maine Road is currently being finalised and ticket-holders for today’s gig are advised to retain their tickets which will be valid for the new date. Otherwise full refunds will be made. Guns N’ Roses’ sellout concert at London’s Wembley stadium will go ahead as planned at the weekend as will the date at Gateshead next Tuesday. The band’s promoters were this afternoon meeting with Greater Manchester Police trying to agree on a new date for the concert. TOP US rock band Guns n’ Roses left 30,000 fans stranded ... but the letdown has done their bad-boy reputation no harm at all. They cancelled the first UK date of their massive world tour yesterday — just 12 hours before they were due on stage at Manchester’s Maine Road. Fans had travelled from across the country to see the bad boys of rock. Most did not hear the show was off until they arrived ready to file in to the football ground. Promoters for the band said that wildman Axl Rose was under doctor's orders to rest for 36 hours after collapsing with exhaustion. The show will now be held on Sunday afternoon. Southport fan Tony Sheh said: “Axl is always at least two hours late going on stage. This time he’s pushed it to five days. “Fans here feel really let down, but as far as the rest of the world is concerned, that’s just the way they are. 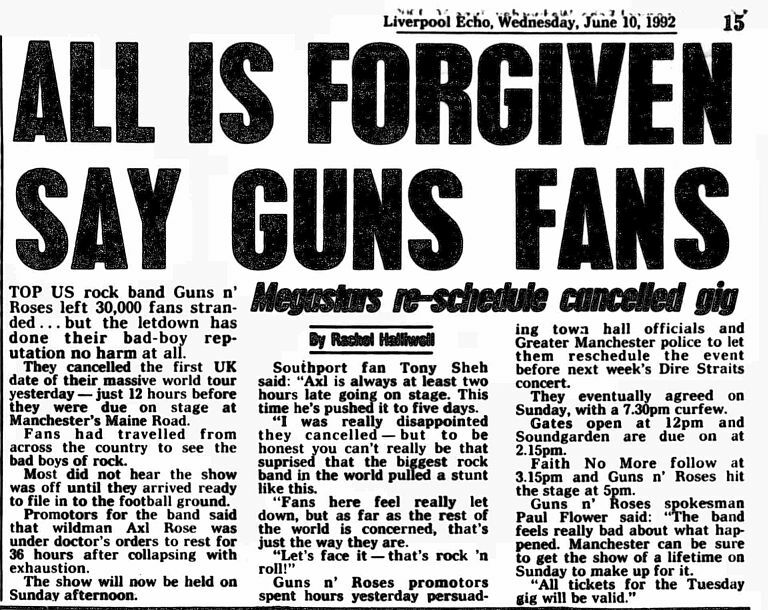 Guns n’ Roses promoters spent hours yesterday persuading town hall officials and Greater Manchester police to let them reschedule the event before next week’s Dire Straits concert. They eventually agreed on Sunday, with a 7.30pm curfew. Gates open at 12pm and Soundgarden are due on at 2.15pm. Faith No More follow at 3.15pm and Guns n' Roses hit the stage at 5pm. Guns n’ Roses spokesman Paul Flower said: "The band feels really bad about what happened. Manchester can be sure to get the show of a lifetime on Sunday to make up for it. ROCK star Axl Rose kept 30,000 fans waiting for more than two hours yesterday for the show he promised would make up for the cancelled Guns N’ Roses concert. Bored fans started a slow hand clap and began to boo and hiss as they waited for the supergroup to come on stage. The show was due to start at 5pm, an hour after support acts Soundgarden and Faith No More finished their performances. On Tuesday thousands of fans were left stranded when Rose cancelled just 10 hours before going on stage because he was suffering from exhaustion. When the band finally came onto the stage they were greeted with applause. But some fans left Manchester City’s Maine Road ground in protest after Rose failed to apologise for being late or the earlier cancellation. The promised two-and-a-half-hour set was cut to an hour and three quarters because of a police curfew. A spokesman for the band said today: “We understand the fans being upset but we don't know why they were so late." 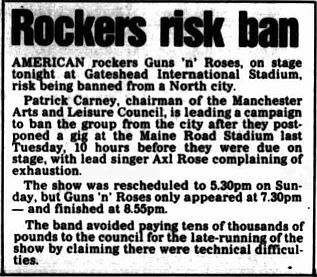 AMERICAN rockers Guns N’ Roses, on stage tonight at Gateshead International Stadium, risk being banned from a North city. Patrick Carney, chairman of the Manchester Arts and Leisure Council, is leading a campaign to ban the group from the city after they postponed a gig at the Maine Road Stadium last Tuesday, 10 hours before they were due on stage, with lead singer Axl Rose complaining of exhaustion. 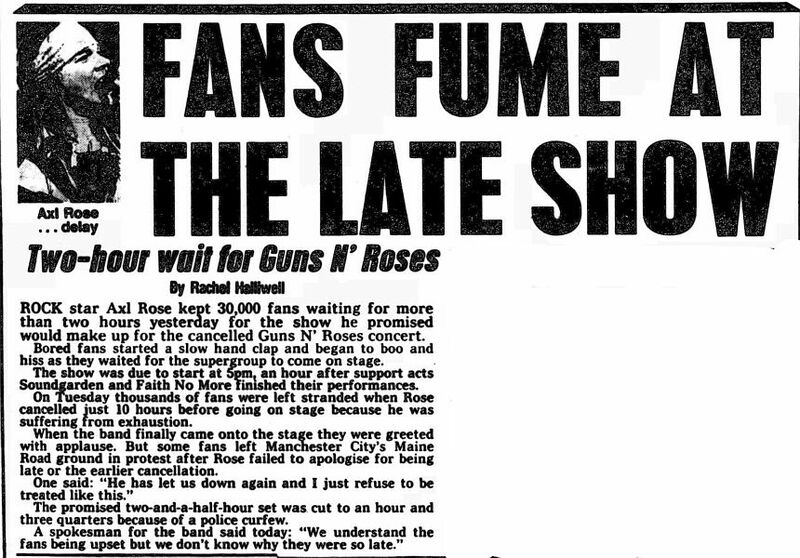 The show was rescheduled to 5.30pm on Sunday, but Guns ‘n’ Roses only appeared at 7.30pm – and finished at 8.55pm. The band avoided paying tens of thousands of pounds to the council for the late-running of the show by claiming there were technical difficulties.